An open lesson is one of the most important forms of organizing methodological work, aimed at a wide exchange of views and experience, contributing to mutual enrichment in the optimal use of interactive teaching methods for developing practical skills and qualities to prepare a future competent specialist. At the beginning of the new school year, a schedule of open classes for the new 2018-2019 school year was drawn up and approved. 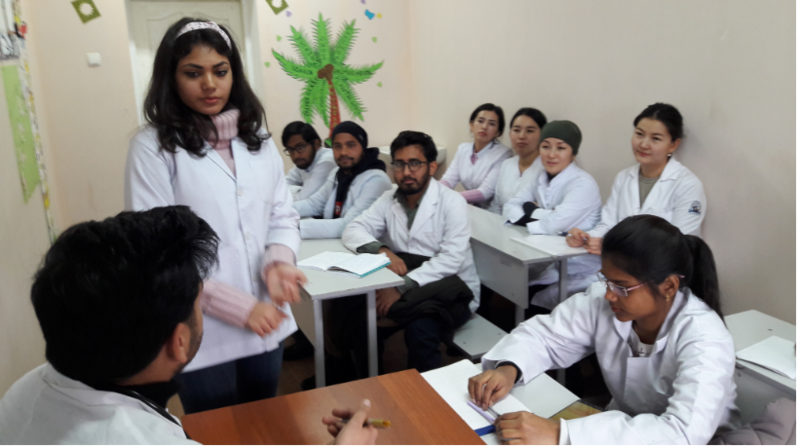 According to the open class schedule for the new 2018-2019 academic year, the teachers of the department “Clinical Disciplines 2” conducted 11 open lessons on the planned topics. Topics were selected, the content of which has practical material, a set of real practical situations. During the lesson, the following teachers: Zh. M. Eralieva, A. E. Omurzakov, G. Zh. Osmonova, Gaipova A. A., Zh. A. Abzhamilova, J. A. Abdirasulova, V. D. Tursunova, A. Z. Tuibaev, S. Bakirov, F. S. Mamasadykova with students demonstrated a practical lesson using active teaching methods such as: brainstorming, small group work, testing, oral questioning, analysis of real situations (case studies), role-playing games , blitz games, designing in the form of games and practice on models and models. As well as at the open lessons, assistant teachers Zh. A. Abdirasulova, V. D. Tursunova, A. Z. Tuibaev, S. Bakirov, F. S. Mamasadykov was attended by members of the DAGKO Osh State University (). During the organization of open lessons at the Department of Clinical Disciplines 2, the special advantages were multimedia technologies (presentation, video viewing on the projector), the application of practical skills on models, immersion of students into the real atmosphere while solving situational tasks and role-playing games and the ability to form clinical thinking in diagnosis and treatment to prepare a competent specialist in the future. The use of the most effective methods and methods of teaching, with the help of which they achieved the expected result (RO) classes, which contributed to the formation of knowledge, skills and professional competencies based on the independent cognitive activity of students. Teachers who attended open lessons after graduation analyzed in detail the advantages and disadvantages of the lesson, noted the level of achievement of the goal (PO theme), the effectiveness of using visual aids, practical skills, the quality of developing a plan-outline on this topic, as well as students’ interest in the course of studying this topic. As a result of the completion of each open lesson, recommendations were given to improve the teaching and documentation methods. The study of depressive disorders of students of MMF at the SNK of the department "Clinical Disciplines 2"